Written by Kahre Hiles. Media by Joey Unger. There is a sickness spreading across America, one we thought we had immunized against in our childhood. That’s right, I’m talking about Crocs. For those of you who don’t know, which is pretty much impossible, Crocs are rubberish shoes with holes in the top (for ventilation?) that take the shape of a clog. You may have seen them on chef Mario Batali or on a small child at the beach. 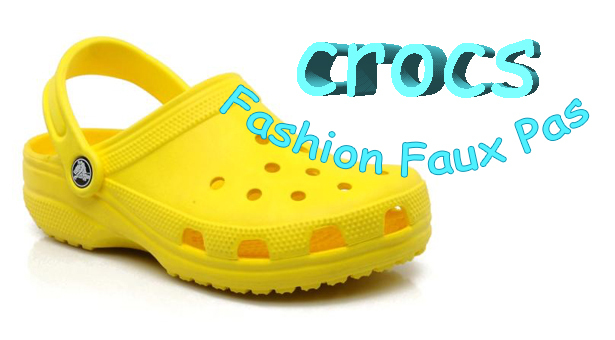 Crocs were The Thing during the early to mid-2000s. People even had charms that would attach to the openings on the top. I remember people having competitions about who had more pairs of these clog-like shoes. In my opinion, the only winners of these competitions were people who had none, but I digress. In short, some people loved these shoes and other people hated them. Even celebrities jumped on the Croc bandwagon. From Jared Leto to former Calvin Klein model Brooke Shields, Crocs were some of the best accessories for an evening out. Eventually, Crocs fell out of style, and soon enough they were replaced by Converse, Toms, Birkenstocks, or Chacos. The only people that I ever saw wearing them after this period of time were children. Now, however, the shoe has reappeared and it seems its popularity will soon skyrocket once again. According to the 2017 fourth quarter reports, the revenue brought in during the fourth quarter was $199.1 million and $1,023.5 million for the entire year. Though sales decreased by 1.6% compared to the 2016 year, it does not mean that the niche of Croc lovers will be dissipating any time soon. You can still find celebrities wearing the eye-catching clogs today, even Prince George and his mother, Duchess of Cambridge Kate Middleton, have been spotted in Crocs. To be clear: I would never wear Crocs. I might even be morally opposed to them. This does not mean, however, that I would look disapprovingly at anybody who loves Crocs or chooses to wear them— I would just be shaken to my core. I am not at all opposed to rubber-type shoes, in fact, Jelly Shoes are a personal favorite of mine. There is just something about Crocs that is displeasing to my eye. Perhaps it is the often-garish colors they come in or the uncertainty I have as to why there are holes in the top. I think my main issue with these shoes is that they provide no shape for your foot—you might as well be wearing a potato. While I think they may be one of the most heinous-looking shoe designs on the planet, I can understand why people would wear them. They are easy to slip on and off, I bet they’re comfortable, and they can certainly be indicative of your personal style. If you want to wear the Crocs, wear the darn Crocs, don’t be bothered by what anyone else says about your choice of footwear. I’m sure you can rock them.